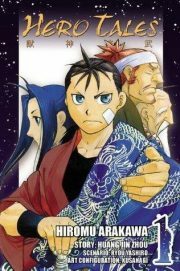 Hero Tales, volume 1 collects the first three issues of Huang Jin Zhou and Hiromu Arakawa’s Jūshin Enbu. Taitou hates the Empire. Reforming the corrupt state seems impossible. At least it is for a hot-headed young man living out in the sticks. He settles for beating up imperial functionaries whenever they pass by his home town. Taitou has potential of which he is utterly unaware. His grandfather knows full well what power Taitou has within him and how to enable Taitou to draw on it. Step one: orchestrate Taitou’s humiliating loss to another martial artist. 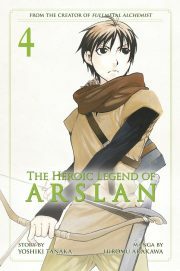 The Heroic Legend of Arslan, book 4 is the fourth collection of Hiromu Arakawa’s adaptation of Yoshiki Tanaka’s light novel series of the same name1. It contains issues 20 to 29. Hundreds of thousands of Lusitanian soldiers are occupying Pars. Prince Arslan’s handful of companions will not be enough to free his land from foreign religious fanatics. Arslan needs an ally who commands an army. Hodir commands Kashan Fortress’ troops and Hodir is eager to support Arslan. There are, however, two impediments. 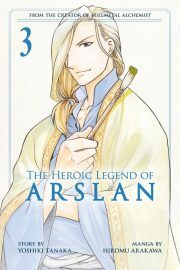 The Heroic Legend of Arslan book 3 collects issues 11 to 19 of Hiromu Arakawa’s manga adaptation of Yoshiki Tanaka’s Heroic Legend of Arslan light novel series. Pars has fallen and its king has been imprisoned, but Prince Arslan is still free. Traitor Kharlan is determined to prove his worth by capturing Arslan. Kharlan has a small army at his command, whereas Arslan counts but four people in his force — and that only if he counts himself. 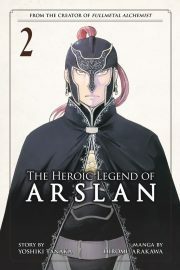 The Heroic Legend of Arslan, Volume 2 is the second collection of Hiromu Arakawa’s manga adaptation of Yoshiki Tanaka’s light novel series. In volume one, overconfidence and arrogance led King Andragoras and his vast Parsian army into ambush and defeat at the hands of the Lusitanian invaders. The King’s fate is unknown. Prince Arslan escaped, but it is unclear how long he can remain free. 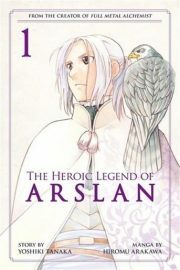 Heroic Legend of Arslan, Volume 1 collects the first four issues of Yoshiki Tanaka and Hiromu Arakawa’s 2013 manga adaptation of Yoshi Tanaka’s light-novel series, The Heroic Legend of Arslan. When we first meet young Arslan, he seems unlikely to figure in any legend, much less a heroic legend. Though he is the crown prince of Pars, he is timid and unsure of himself. He’s certainly not a self-assured, bold figure like his father, Andragoras III. As confident off the battlefield as he is on it, Andragoras III is the embodiment of Parsian virtue. 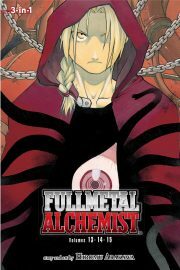 Viz’ Fullmetal Alchemist (3-in-1 Edition), Volumes 25–27 includes Volumes 25, 26, and 27 of the original Japanese manga1. Story and art are by Hiromu Arakawa; English translation by Akira Watanabe; English adaptation by Jake Forbes; touch-up art and lettering by Wayne Truman. The original manga appeared in 2010. The nice thing about series whose author has a destination in mind is the comparative absence of supporting characters who don’t actually support anything and subplots that don’t go anywhere. The less nice thing is that eventually the story reaches that destination. End of the line. Which gets me to Fullmetal Alchemist (3-in-1 Edition), Volumes 25–27. 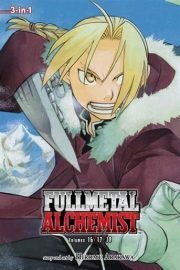 Viz’ Fullmetal Alchemist (3-in-1 Edition), Volumes 22–24 includes Volumes 22, 23, and 24 of the original Japanese manga1. Story and art are by Hiromu Arakawa; English translation by Akira Watanabe; English adaptation by Jake Forbes; touch-up art and lettering by Wayne Truman. The original manga appeared in 2009. Adults are offered many opportunities to defer gratification, such as spacing out the last few volumes of a limited series instead of hoovering them up all at once. Adults can also say “screw delayed gratification; finish the series!” and get away with it. Guess which kind of adult I am. Which brings us to the eighth, second-to-last, 3-in-1 omnibus of Fullmetal Alchemist. In this volume, plans come together. Sorta kinda. 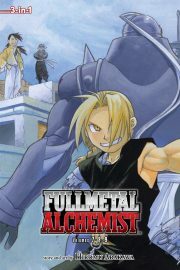 Viz’ Fullmetal Alchemist (3-in-1 Edition), Volumes 19–21 includes Volumes 19, 20, and 21 of the original Japanese manga . Story and art are by Hiromu Arakawa; English translation by Akira Watanabe; English adaptation by Jake Forbes; touch-up art and lettering by Wayne Truman. 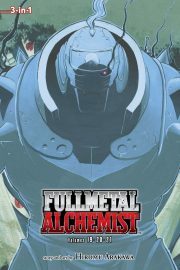 The original manga appeared in 2008.
and worst of all, Alphonse Elric’s soul is beginning to reject the armour that houses it. 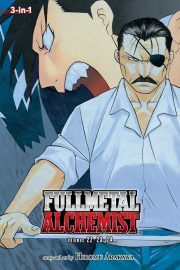 Viz’ Fullmetal Alchemist (3-in-1 Edition), Volumes 16–18 includes Volumes 16, 17, and 18 of the original Japanese manga1. Story and art are by Hiromu Arakawa; English translation by Akira Watanabe; English adaptation by Jake Forbes; touch-up art and lettering by Wayne Truman. The original manga appeared in 2007. Still processing the revelations of the last few issues, Alphonse and Edward Elric head north to the Briggs’ Fortress, the kingdom of Amestris’ primary defence against neighbouring Drachma. In any sensible universe, Briggs’ commanding officer Major General Armstrong would be the most terrifying aspect of the trip. But as this is Fullmetal Alchemist, there’s far worse waiting for the brothers than one ruthless senior officer. 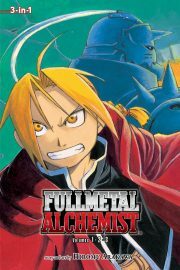 Viz’ Fullmetal Alchemist (3-in-1 Edition), Volume 4 includes Volumes 10, 11, and 12 of the original Japanese manga. Story and art are by Hiromu Arakawa; English translation by Akira Watanabe; English adaptation by Jake Forbes; touch-up art and lettering by Wayne Truman. The original manga appeared in 2005. The English translation appeared in 2013. Volume 1 was reviewed here. Volume 2 was reviewed here. Volume 3 was reviewed here. Eager to clean up loose ends, the homunculi have released Barry the Chopper’s former body into the wild. Although Barry’s soul is housed in a tough metal body, that soul is still connected to his body by his spiriti. The plan: body will naturally seek out soul, and in so doing lead homunculi Envy and Gluttony to their disloyal servant. It was a plan as straightforward as it is doomed. Now Barry’s old body is on the run and might lead enemies directly to one of Father’s lairs (Father being the big bad and the creator of the homunculi). 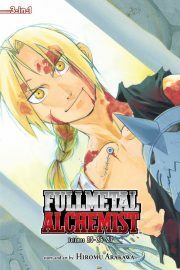 Viz’ Fullmetal Alchemist (3-in-1 Edition), Volume 3 includes Volumes 7, 8, and 9 of the original Japanese manga. Story and art are by Hiromu Arakawa; English translation by Akira Watanabe; English adaptation, by Jake Forbes; touch-up art and lettering by Wayne Truman. The original manga appeared in 2004. The English translation appeared in 2011. Volume 1 was reviewed here . Volume 2 was reviewed here. Al receives a tantalizing unsigned note. It suggests a meeting in an isolated location. Although he is only fourteen, Al is canny enough to suspect a trap. But he is also familiar with the meeting location and composed entirely of metal … so Al is understandably confident in his ability to handle any trouble he might encounter. Viz’ Fullmetal Alchemist (3-in-1 Edition), Volume 1 includes Volumes 1, 2, and 3 of the original Japanese manga . Story and art are by Hiromu Arakawa; English translation by Akira Watanabe; English adaptation, by Jake Forbes and Egan Loo; touch-up art & lettering by Wayne Truman. The original manga appeared in 2003. The English translation appeared in 2011. Wait! Are you confused yet? As my editor was confused? “You already reviewed Full Metal Alchemist!” Yes, but I reviewed the second volume in the series, not the first. Which was checked out and never returned to Kitchener Public Library. On a war-wracked continent, two young brothers wander from town to town. 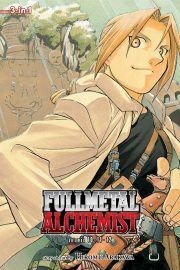 Although Edward Elric is only fifteen and Alphonse Elric is just fourteen, both are skilled alchemists. Indeed, their skill is only outmatched by their boldness, which is why they are searching for the Philosopher’s Stone. 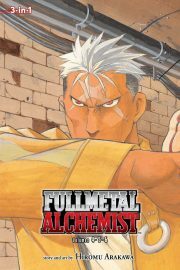 Viz’ Fullmetal Alchemist (3-in-1 Edition), Volume 2 includes Volumes 4, 5, 6 of the original Japanese manga . Story and art are by Hiromu Arakawa; English translation by Akira Watanabe; English adaptation, by Jake Forbes and Egan Loo; touch-up art & lettering by Wayne Truman. The first thing a stranger might notice about Edward Elric is his prosthetic arm and leg. The first thing they might notice about Edward’s younger brother Al is his huge metal body. More on those detail later. Both are skilled alchemists. Both are not yet teenagers. Both are members of a military organization, trading service for training. As Volume 2 of the omnibus edition opens, Al and Ed have gotten their asses soundly kicked by a stabby, shape-shifting woman named Envy and her minions . Death is a distinct possibility.